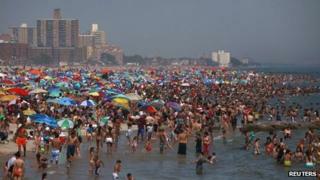 July was the hottest month the continental US has seen since records began, federal scientists have said. Last month, the average temperature was 77.6F (25.3C), hotter than the old record from July 1936, during a period of severe drought known in the US as the Dust Bowl. The last 12 months were the warmest since modern records began in 1895. It was also more than 3F warmer than the average temperature in July during the 20th Century. Climate scientist Jake Crouch, from the National Climatic Data Center in North Carolina, attributed the phenomenon to both localised heat and drought, as well as global warming, according to the Associated Press. "It's a pretty significant increase over the last record," Mr Crouch said. The current heat "is out and beyond those Dust Bowl years. We're rivalling and beating them consistently from month to month." He added that the high night-time temperatures seen in 2012 set this year's heat apart from the Dust Bowl era. The National Oceanic and Atmospheric Administration (NOAA) has noted that its index for measuring extreme weather - and not simply heat - has surpassed its old record, set in 2011. The US Extreme Climate Index, which reflects how much of the nation is experiencing extreme weather, is at 37% - above an average of 20%. For the first seven months of the year the index was at 46%, trumping the old record set in 1934. Meanwhile, the NOAA's drought monitor suggested that 63% of the lower 48 states was affected by drought, and would lead to the smallest corn yield in the last six years. President Barack Obama has called on Congress to pass a farm bill that would provide assistance to livestock farmers who require disaster assistance, but currently have access to less insurance than crop farmers. The US is the world's largest grower and exporter of corn and soybeans, and the heat and drought has prompted global concern over increasing food prices.